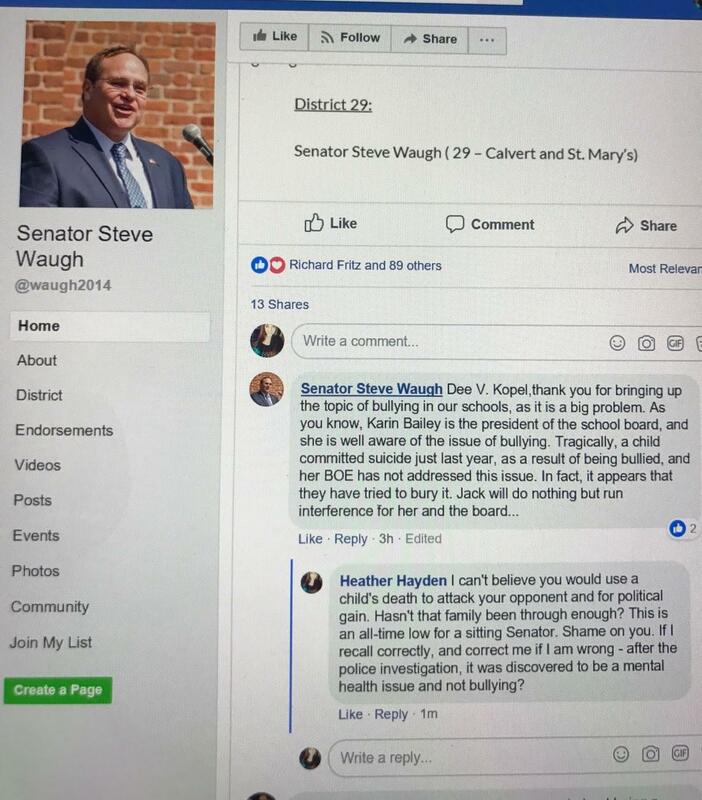 Senator Steve Waugh attacked the wife of his opponent and politicized the suicide of a middle school student in a bizarre series of Facebook posts last night, according to Facebook posts shared with Red Maryland. 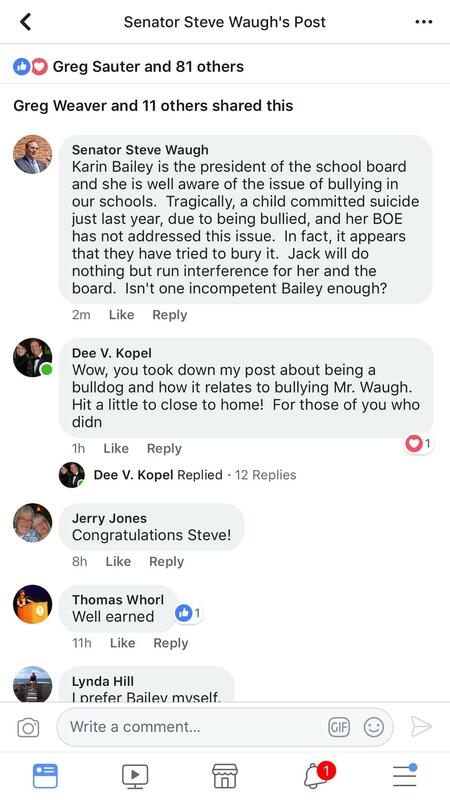 In a post unrelated to the issue, Waugh took a shot at Karin Bailey, President of the St. Mary’s County Board of Education and the wife of Waugh’s primary opponent, Jack Bailey. Karin Bailey is running unopposed for her School Board Seat this year. 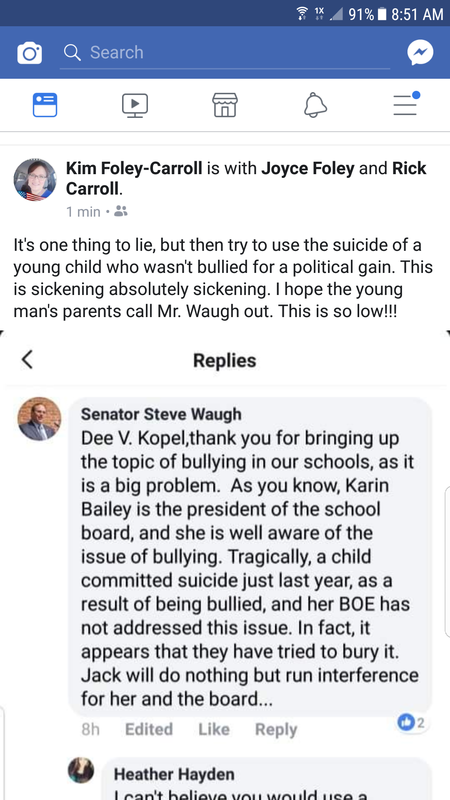 Waugh also made the same comments on a separate Facebook post that called out Waugh for using the suicide of a school student for political gain. Constituents of Waugh’s were not buying it and called out Waugh for his crass politicization of the issue. To make matters worse, Waugh’s arguments about bullying and suicide were completely unfounded. There was an investigation conducted by the St. Mary’s County Sheriff’s Office regarding the bullying allegation and the Sheriff’s Office did not believe that bullying contributed to the child’s tragic death. Something that was reported on by the local media. Waugh was getting a lot of heat on social media for posting the story. 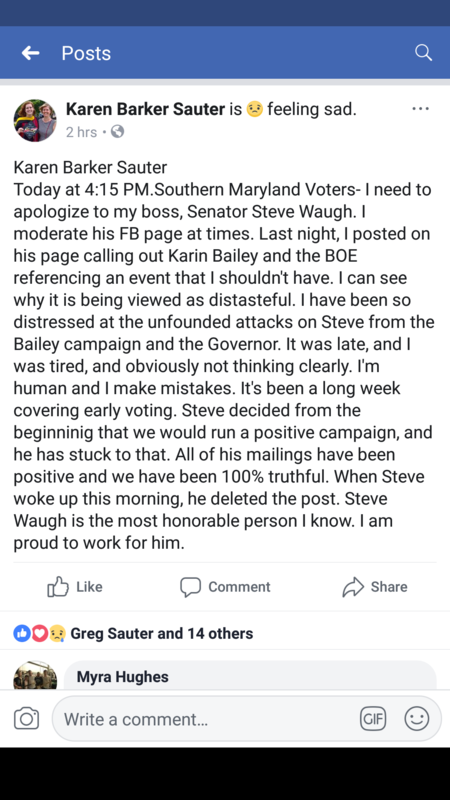 So much so that Waugh’s assistant fell on her sword and took responsibility for the posting while at the same time blaming Governor Larry Hogan and Jack Bailey for the post. Sauter’s comments seem to be apologizing for the reference to the tragic suicide, but not for the attacks on Karin Bailey which some might construe as being sexist. While we understand the stresses of the campaign, this behavior from Waugh or from the Waugh campaign is not acceptable. While it is understandable to see the frustration of the Waugh camp in the fact that everybody from Governor Hogan to us at Red Maryland have endorsed his primary opponent Jack Bailey, it is never politically appropriate to use the suicide of a middle school student for political gain. And other than sharing Sauter’s Facebook post, Waugh has made no statement of apology on his own for the remarks that were said under his name. Conservatives should be better than this.